[SatNews] NASA books a fast ride on a commercial carrier. The space shuttle program is retired, and so NASA has engaged the services of Sir Richard Branson's private venture, Virgin Galactic, to service rides to the edge of space. Virgin Galactic announced that the agreement includes NASA to charter a full flight from the company, and it includes options for two additional flights. If all the options are used the value of the contract is $4.5 million, providing opportunities for engineers, technologists and scientific researchers to conduct experiments in suborbital space. Sir Richard Branson's Virgin Group and Aabar Investments PJS, says each mission allows for up to 1,300 pounds of scientific experiments. 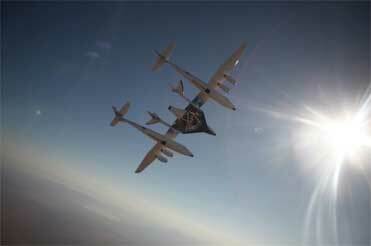 The research flights mark an important milestone for Virgin Galactic, and has collected more than $58 million in deposits from 455 future tourist astronauts — providing access to space to researchers is viewed by Virgin Galactic as a significant business opportunity. "Each mission allows for up to 1,300 pounds of scientific experiments, which could enable up to 600 experimental payloads per flight," the company said in a release. "Providing access to space to researchers and their experiments is viewed by Virgin Galactic as both a future mission segment and a significant business opportunity." 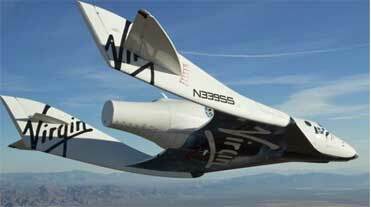 Based on the Ansari X Prize-winning SpaceShipOne, SpaceShipTwo is 60 feet long and can carry six passengers and two pilots. Based on the Ansari X Prize-winning SpaceShipOne, SpaceShipTwo is 60 feet long and can carry six passengers and two pilots, and launches from a mothership, WhiteKnightTwo, at around 50,000 feet, and ascend to the edge of space, some 60 miles above Earth, powered by a hybrid rocket motor. Passengers, who could start riding the space plane as early as next year, will experience weightlessness and view the curvature of our planet. Tickets sell for $200,000, and Virgin reports more than 450 bookings.